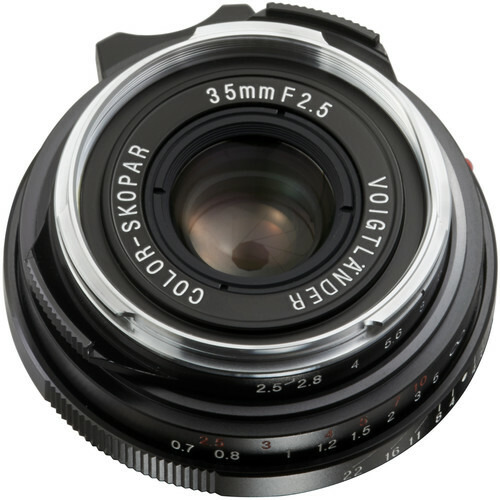 An incredibly thin and versatile lens, the Color-Skopar 35mm f/2.5 P II from Voigtlander is a wide-angle prime designed for M-mount rangefinder cameras. Its pancake profile makes it ideal for everyday walk-around use, and general wide field of view is well-suited to a wide variety of shooting applications. Its manual focus design permits working with subjects as close as 2.3' away, and an optional removable lens hood is available to shield the front lens element to minimize flare and ghosting. Slim, 0.9"-thick pancake profile makes this lens especially inconspicuous and portable. Compatible with optional LH-4N lens hood. Box Dimensions (LxWxH) 4.7 x 4.0 x 3.2"
Color-Skopar 35mm f/2.5 P II Lens is rated 4.2 out of 5 by 22. Rated 4 out of 5 by nanthor from Sharp, nice bokeh, well built. I've had 2 copies of this lens over the last few years and both were sharp, with a medium contrast similar to the version IV summicron. Both were also very well built with no looseness anywhere and both the focus tab and the aperture tabs were easy to access and use, they both fell-to-hand naturally and I have slightly large hands. This is a very capable lens and there are no negatives that I can find. I use it for B&W film and full-frame digital (it does vignette but that can be fixed in PP) and mainly for B&W in digital so I can't really comment on it's color accuracy. For the price, you will not be disappointed. Rated 5 out of 5 by Mindlessbuttonmasher from Razor Sharp I decided to get this lens as a second lens for my Sony NEX 5N which equals a 'normal' focal length. One of the deciding factors was the size, which is tiny and just a tad smaller (thinner) than my Voigtlander Color-Skopar 21mm f/4P lens. I've read some good reviews on this lens, and talked to a few other photographers shooting with it, and they had nothing but great things to say about it. The second factor was that it is also very similar to my VM 21mm in build, feel and focus so switching between the two takes very little effort. Although the focus throw on this lens is shorter (which is a good thing). Finally, I decided to buy this over the Voigtlander 35mm f/1.4 because it's smaller, cheaper by a few hundred dollars and I've read over and over again how the f/1.4 lens is not really sharp until f/2.5 so what's the point? I couldn't be happier. As for my experience level, I have more than 10,000 photos published to my credit so I've used a few lenses in my time. Rated 4 out of 5 by Daniel from Nice lens Cv 35f2.5. Solid performer. Using it on M240, a7, and nex 6. Nice color, sharpness, and clarity. Not a summicron or summilux (I use both) but something like 1/10 the price. For an everyday lens that you neither have to worry about losing or worry about image quality, it's excellent. Rated 5 out of 5 by Dr Richard from A WINNER In 1925, Leica was promoted as a pocket camera. I am going back to basics...a few lenses in my pockets and the camera. With this lens, my M 10 is truly pocketable. I set the lenss selector to the sumilux setting and all is well with the world - wonderfull color & resolution. No, can't match my summicron wide-open but still very good and useful. Rated 5 out of 5 by Anonymous from surprisingly good Five star rating is because of value for money. This is a great lens and well made but of course it snot a Leica or a Zeiss. Neither build quality or performance matches a new lenses from either but unless you are a pro giving the lens a daily punishing and producing 40x30 gallery prints you will probably never notice the difference. Rated 5 out of 5 by Paul from Great Lens I use this with a metabones adaptor on my NEX 7. It is nice and small, although the adaptor adds to the size. I set the camera to manual focus assist with yellow peaking color, it is fast, accurate and easy to focus. Once I got a little practice I think my focus was faster than with an autofocus lens.It also is sharp, with good bokeh. The max aperture of 2.5 is usually not a problem, I just raise the ISO in low light. Rated 5 out of 5 by Jaushua from Fantastic lens with classic charm I've had this lens for almost a year now and it's a pleasure to shoot with. I have it mounted on a Sony a7 and together it makes a nice everyday shooting set-up. The lens itself is nice and compact. The focusing is smooth and the aperture clicks are wonderful. Nice and sharp when stopped down but is slightly soft when wide open, the softness isn't a bad thing though. All it does is add a sort of vintage aesthetic to the photos. Rated 3 out of 5 by saurabh from Excellent build quaity, but not suitable for Fuji X series Very compact, perfectly weighted, and excellent ergonomics. Sadly, on my X-T1, the lens produces a strong magenta cast in bright conditions (see attached sample). If you own a full-frame rangefinder, or your copy does not create this type of cast, you'll love this lens. But for me, it adds a tedious step to the processing flow for each image I shoot in bright sunlight or high contrast situations, so I had to return it. When was this VM mount version first made? The PII version of this lens came out in 2004. if you go to the Camera Quest site which specializes in Voigtlander you can learn more about it. I enjoy it, it is small and gives quite good images. I also had owned a 35 1.7 Ultron. it is a much newer lens design that is much more technically corrected, but in my opinon does not give as contrasty images. I sold it.I use my 35 CS on both my Sony digital and Leica film cameras. I use a metabones Leica m-e mount adaptor. It adds about a 1/4 inch to the width. Anyone use this on Fuji x camera and how is performance? I bought it specifically to compliment the 21mm Skopar for my XPro2. I love the Skopars. They produce decently sharp results (I've printed 20&quot;x30&quot; posters with some minor cropping), with a pleasing (to me) warm color tone. All in all a great walking around lens. can I use it with sony a7 mark 2?